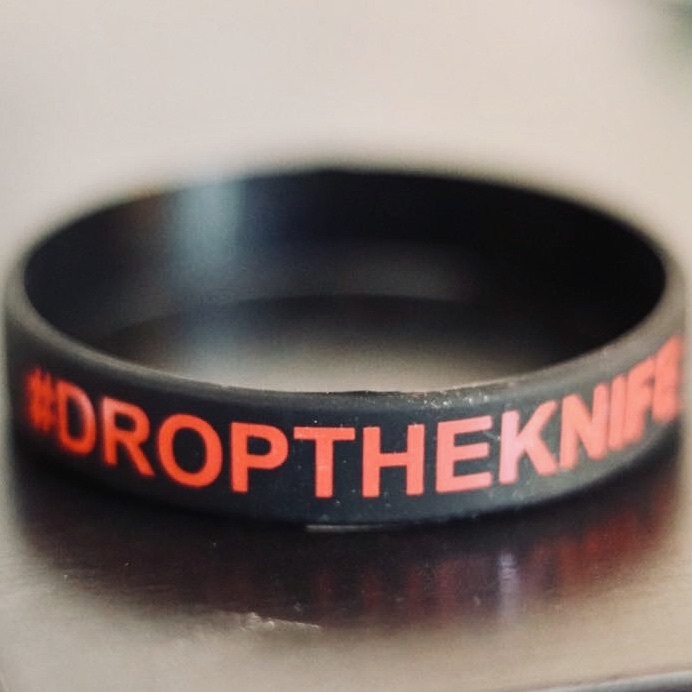 Drop the Knife was formed with the aim of providing a cohesive educational package on anti-knife crime and gangs into schools and colleges, and youth, sports and community-based organisations. The idea to start the company came from Will Flint who was stabbed 12 times on the 1st January 2017 in Birmingham. Although Will has made a full recovery, he still has effects from the injuries he received. They have now formed the CIC company with three directors including Will who is the CEO. Will has made several appearances on television and radio talking about knife crime and his story, most recently on various BBC Radio stations. They are based in the Piece Mill, Halifax (on Horton Street by the Piece Hall) and are looking for volunteers that can put in a couple of hours a week helping to organise fundraising activities or helping with sponsored events. Voluntary Ambassadors are also required to deliver their educational package in schools. If you are interested in helping with the CIC & Charity, please contact through their website: www.droptheknife.org.uk or contact Brian Reeves: brian.reeves@droptheknife.org.uk. This entry was posted in Get Involved / Have Your Say, Health, volunteering, Young People and tagged Drop The Knife. 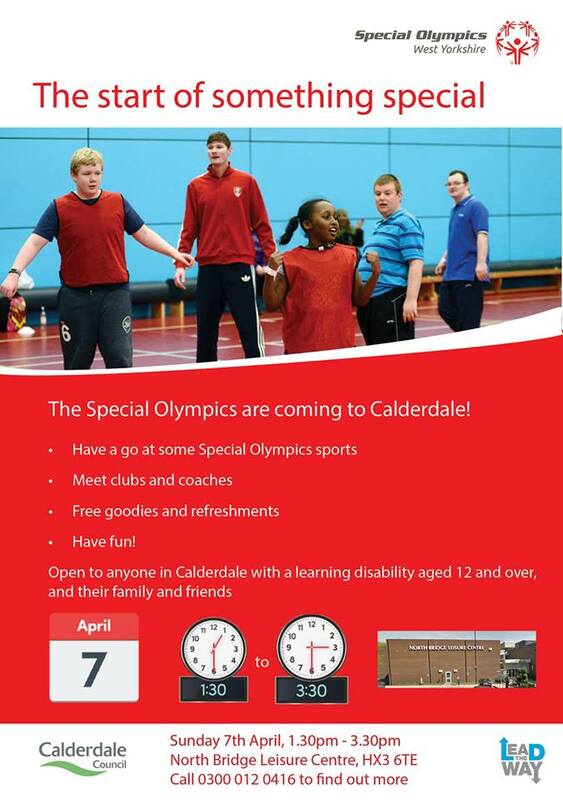 Go along to a Special Olympics Taster Session on Sunday 7 April, 1:30pm-3:30pm at North Bridge Leisure Centre HX3 6TE where you can have a go at a number of Special Olympic sports, receive free goodies, meet local clubs and coaches and find out more about how YOU can get involved in the Special Olympics in Calderdale! Open to anyone aged 12 and over with a learning disability in Calderdale, their family, friends and supporters. This entry was posted in Apr, Events, Young People and tagged Lead the Way, North Bridge Leisure Centre, Special Olympics. At Eureka! they’re exploring the zany, zigzag world of Steampunk this Easter with three weeks of Steampunk Science from Saturday 6 to Sunday 28 April! Professor Spark will be running regular shows, where you can learn about the amazing properties of light and sound, and head to the ‘All About Me’ gallery where steampunk scientists will astound you with mind tricks! The Eureka! ‘Imagination Space’ will be open every day with a range of different activities and crafts for kids to have a go at – perfect for children aged 6+. Find out more on the website! Eureka! will be open 10:00am-5:00pm every day, including over Easter weekend when you can hop along to meet a rather unusual Easter Bunny! Steampunk Science activities are included in the price of admission, or free to annual pass holders. This entry was posted in Apr, Events, Young People and tagged Eureka! Children's Museum. A date for your family diary! 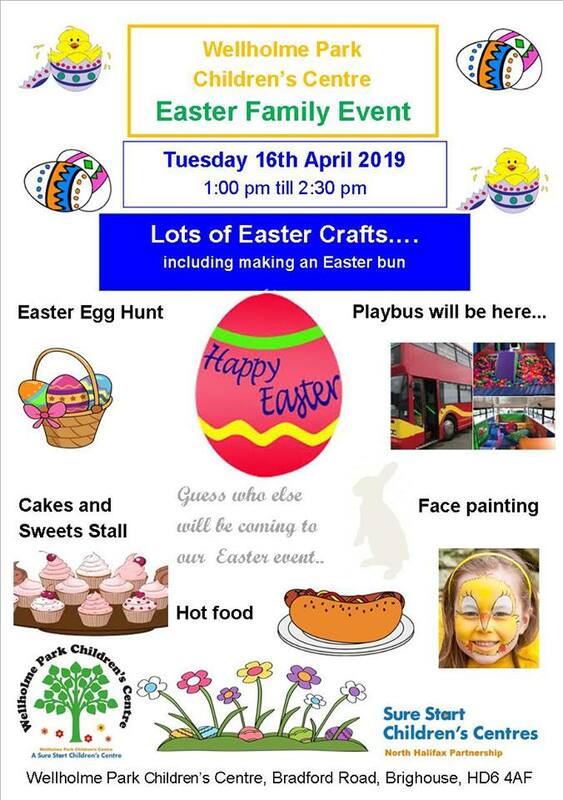 Wellhome Park Children’s Centre, Bradford Road, Brighouse HD6 4AF will be holding their Easter Event on Tuesday 16 April, 1:00pm-2:30pm with lots of Easter crafts and the Playbus. There will be an Easter Egg hunt, cakes and stalls, hot food and plenty of fun. This entry was posted in Apr, Events, Sure Start, Young People and tagged NHP Sure Start Children's Centres, Wellholme Park Children’s Centre. There will be a £1 charge for materials, extra for larger pots. 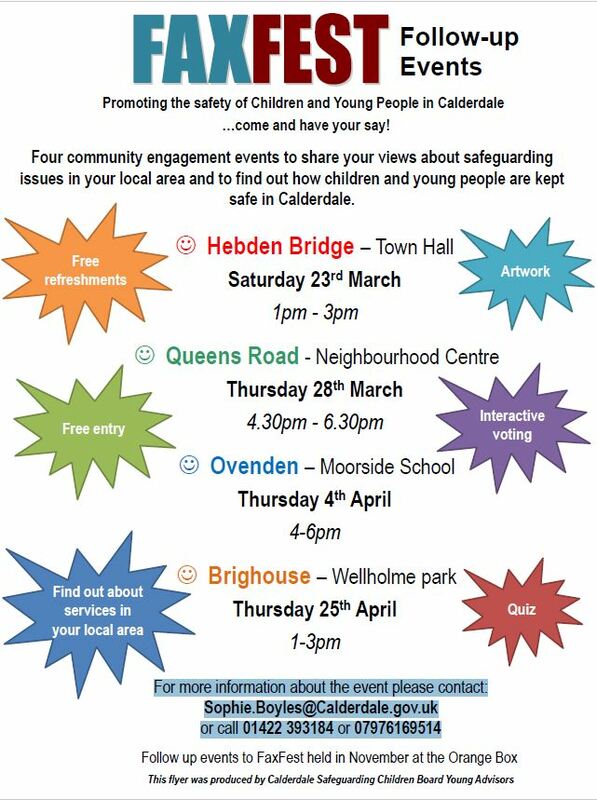 This entry was posted in Apr, Brighouse, Events, Get Involved / Have Your Say, Young People. We’re delighted to announce that we’re hosting a free LEGO club for children with autism and their siblings, thanks to the support of Calderdale’s Short Breaks programme. Clubs will be run by our brilliant friends Bricks4Kidz, with a LEGO workshop lasting an hour and free admission to the museum for the day too! Places are limited, so must be booked in advance. Interested? Head to our website for a bit more info, and call us on 01422 330069 during office hours to book your place (ask for Leanne, Trizia or Lorraine). This entry was posted in Apr, Events, Young People. Halifax Canoe Club – we love canoeing and want you to love it too! Come along to Hollins Mill pub in Sowerby Bridge on Tuesday 26 March 2019 and find out more about what Halifax Canoe Club can offer you! We’re an active and family orientated club based on the River Calder in Sowerby Bridge, Halifax. Those new to the sport will need to start on one of our beginners courses where our qualified coaches will introduce you to the skills you need to start paddling safely. As you progress our coaches can introduce you to move advanced skills, white water paddling, open canoes, slalom and freestyle canoeing. There’s also the chance to try sea kayaking, surfing, slalom racing, weekends away and during the winter much of the club’s activity is heading off on river trips to suit various levels of ability. Never paddled before and want to see if it’s for you? Try one of our taster sessions – they’re on 6 and 7 April. We provide everything you need – boats, kit and coaches to keep you safe and make sure you’re having fun! Available for anyone ages 7+. Want to paddle but don’t know how? You should take our Learn To Paddle Course – this runs for 8 weeks. These are on Mondays and Thursdays from 29 April. There’s a course starting in June as well, subject to demand. We’ll release dates nearer the time. The Learn to Paddle Course is available to everyone aged 7+. Already know how to paddle and want to refine your skills? Take our River Skills Course – you can choose Mondays and Thursdays from 29 April.. There’s a dry induction night on Monday 8th April or Thursday 11th April. There’s another course running in June – we’ll release dates nearer the time. This course is available to everyone aged 7+. Can’t make it to our Hollins Mill sign up night and want to join a course? Sign up online HERE – NOW! Annual membership includes the cost of all river courses, coaching and also the cost of using our equipment (boats, safety gear etc). We offer reduced rates for families, concessions rates and junior rates – please take a look at our membership options HERE. Please remember that everyone at Halifax Canoe Club is a volunteer – we give up our own time to support you as a paddler – have fun and we’ll see you on the water! This entry was posted in Apr, Events, Health, June, Mar, Young People.